The first-ever environmental lawsuit in Albania concerns the Vjosa river and the future of hydroelectric plans in the country. In May 2017, a local court announced its decision against the Poçem dam project. The Vjosa is reputed to be the last big wild river in Europe, outside Russia. According to data published by ‘Save the Blue Heart of Europe’, a campaign launched by two international NGOs, the Albanian government plans to build over 400 hydropower plants across the country, including eight dams on the Albanian stretch of the Vjosa River and 23 hydropower plants on its tributaries . The wave of dam and small hydropower projects across the Balkan countries (which has been reported in many cases in the EJAtlas) has received much of its funding from large multilateral development banks like the European Bank for Reconstruction and Development (EBRD) and the World Bank’s International Finance Corporation (IFC) .The Ministry of Energy and Industry would not confirm these figures for Albania or the types of structures that are planned, saying that every project proposal is individually assessed and the technology to be used will only be determined at a later stage. To date, the ministry has granted licenses for the construction of two hydroelectric dams on the Vjosa at Kalivaç and Poçem, while a number of hydropower plants are already under construction on the river’s tributaries. Plans to dam the Vjosa are not new. In 1997, the Albanian government licensed the Italian Becchetti Group to build the country’s first concessionary hydroelectric dam at Kalivaç. The dam, designed with a height of 45 meters and a reservoir capacity of 350 million cubic meters, was scheduled for completion in 2002, but 14 years on the project remains only 30% completed following a series of missed deadlines. The delays are the result of ongoing disputes between the government and the Becchetti Group amidst allegations of political intrigue, fraud, money laundering and forgery. The conservation organization EcoAlbania. Riverwatch and EuroNatur, together with 38 affected residents, filed a lawsuit against this project. In Feb 2017, for the first time the local Government of the Vjosa Valley in a public reaction made a statemend against the hydro-power plants. After the local community, national and international NGOs, scientists and the European Parliament this time also the mayors have unified their voice to protect the Vjosa. The mayors of Përmet, Tepelenë, Memaliaj, Mallakastër and Selenicë sent an open letter to the Prime Minister Edi Rama and the head of the Albanian Parliament Ilir Meta raising the concern of the local communities that they represent. On 2nd May 2017, the judges of the Albanian Administrative Court in Tirana announced their decision against the construction of the projected hydropower plant “Poçem”: for the time being, the dam must not be constructed. According to the Court ruling, were an inadequate EIA as well as the absence of proper public consultation of affected residents. Both procedures are required by Albanian law for projects of this kind. However, their application was a farce. For the EIA commissioned by the project applicants and approved by the Ministry of Environment, no in situ examination was carried out, no data on occurrences of species or projected impacts on ground water was conducted, and 60 percent of the text was simply copy-pasted from other assessments and thus not even site-specific. Similarly, the public consultation procedure was utterly dubious: the required consultation did indeed take place, but without the affected community – they were simply not invited. Instead, 20 employees of the municipality of Fier – a town 80 kilometers away from Poçem and not even located at the Vjosa – listened to the project applicants’ announcements. Local communities along the Vjosa know the dams will submerge everything: their homes, their land – even their identity. Marson Murataj, 29, who lives in the village of Kuta between Kalivaç and Poçem, says that the dam at Poçem will flood most of Kuta and its agricultural land. It will also affect the neighboring villages of Anebreg, Corrush and Sevester and their agricultural land. Most communities living along the Vjosa live off agriculture, livestock farming and fishing. The dam projects would have far-reaching consequences for them, according to Murataj. “The Poçem Dam will affect up to 10,000 people and flood thousands of hectares of agricultural land in the area, depriving us of our main source of income,” he says. 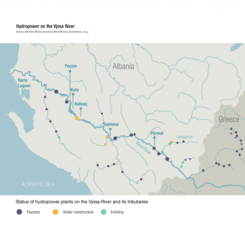 “This decision shows the importance of fighting disputed hydropopower projects on a legal level – not only in Albania but in the entire Balkan region. Many – if not most – of the 2700 projeted hydropower plans in the Balkans contradict national and European legislation. We will prepare further legal actions against project that we perceive as unlawful”, signals EuroNatur CEO Gabriel Schwaderer. 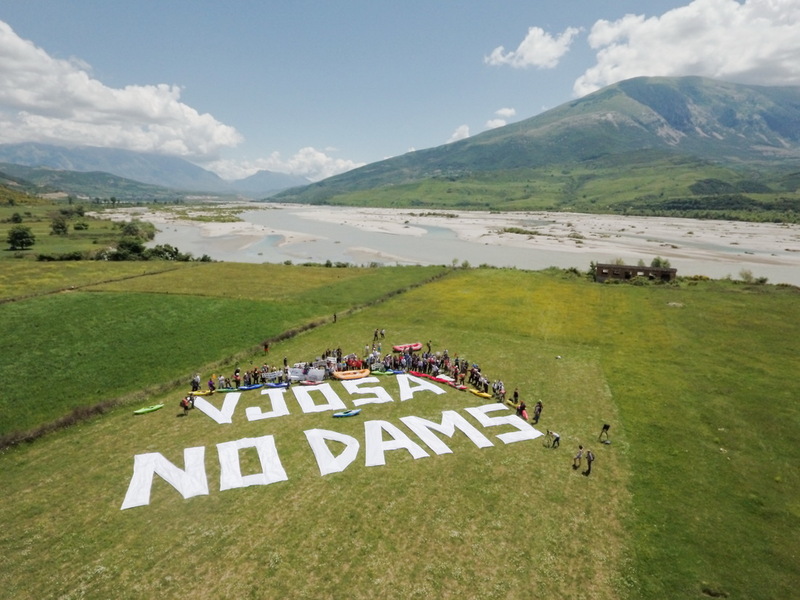 He also added: "“We demand that the entire Vjosa – from the mountains to the Adriatic Sea – be declared as a national park, Europe’s first Wild River National Park. This would also be the best solution for the economic future of the valley.” All mayors of the valley support this demand as they recognize the potential of a national park for the development of eco-tourism." Project Details The Vjosa is the last big wild river in Europe outside Russia. Entirely unobstructed, she flows through inaccessible gorges and sections with enormous gravel banks and islands on her course of almost 270 kilometers from the Pindus Mountains to the Adriatic Sea. 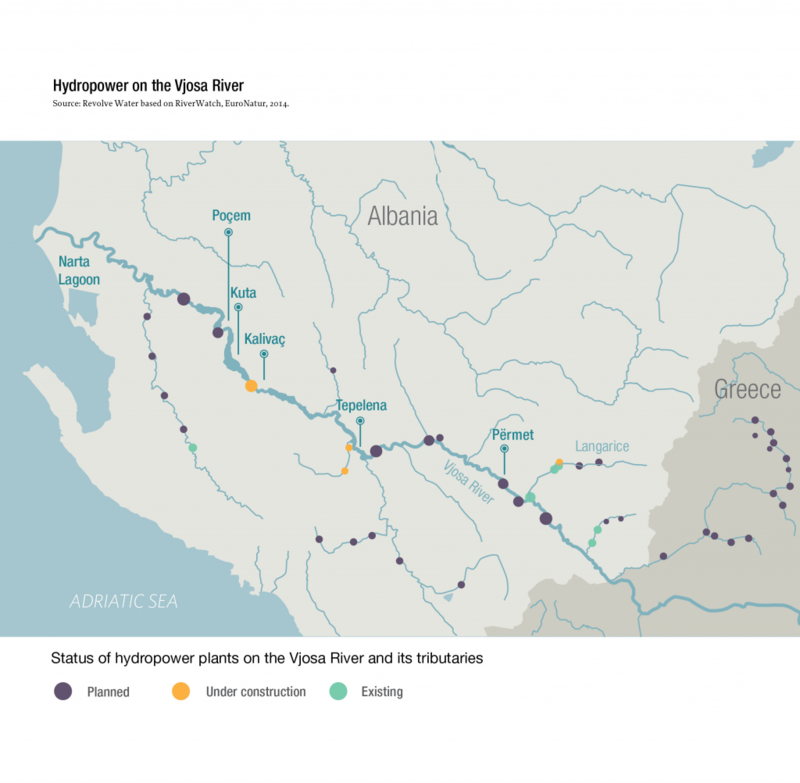 The Albanian government under Prime Minister Edi Rama intended to have a Turkish company construct a hydropower project within the ecologically most valuable stretch of the Vjosa. The project “Poçem” woul feature a 25 meter tall dam wall. In summer 2016, Kayakers from Slovenia, Albania, Greece, Italy, Germany, Austria, Netherlands and the US participated in today’s activity. It was part of the “Balkan Rivers Tour” – an activity of kayakers from all over Europe against the looming dam tsunami in the Balkans. 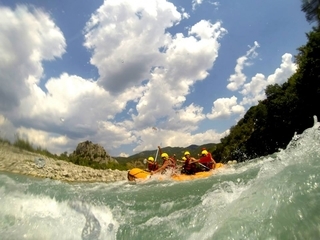 “We have been paddling rivers between Slovenia and Albania for 33 days. Development of Alternatives A group of scientists from Albania, Austria and Germany has called for a three-year moratorium on all construction plans on the Vjosa and its tributaries, in order to allow for the implementation of an interdisciplinary research and assessment program on the Vjosa River. They suggest the Vjosa could serve as a “large-scale natural refuge and laboratory of pan-European significance” and an international reference site for climate change research. Also, instead of hydro exploitation, campaigners believe that the Albanian government should develop eco-tourism opportunities along the Vjosa and generate power from other renewable sources such as wind and solar. With 265 days of sun per year, Albania indeed has a high potential for solar power generation. -The cancellation of all hydropower plant concessions that are planned or are under construction on the Vjosa River and its tributaries. -The proclamation of the entire Vjosa Valley a National Park, which would be the first Wild River National Park in Europe and it support economic development of the entire valley. 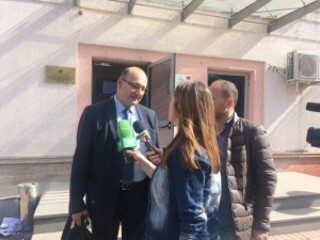 -To be taken in consideration the demand for a 3-years moratorium on hydropower plants on the all Albanian rivers, which would give to the experts and decision-makers enough time to evaluate in a scientific and rational way the benefits and losses from the construction of these hydropower plants.